Butterscotch the Cat died February 1, 2011 at 3 p.m. in our ten-year old son Kevin’s arms. He was just 3 1/2 years old. Butterscotch was Kevin’s best friend. Every morning Butterscotch would come in from the garage and go straight to Kevin’s bed to curl up under the covers with him until breakfast. Every afternoon, Butterscotch would hang out on Kevin’s bed and watch Kevin build Legos. Kevin celebrated every birthday and half-birthday with Butterscotch, buying him cat treats and toys. Butterscotch might have been the most loved cat in the world! At Christmas time Butterscotch started sleeping for hours and hanging out by the wood-burning stove. We took him to the vet twice. They diagnosed him with an auto-immune disease which was attacking his red bloods cells and a virus. They put him on steroids and antibiotics. Twice a day for a month, Kevin and his dad gave Butterscotch his medicine. This consisted of holding his paws from scratching, and popping pills down his throat. Poor Butterscotch! Poor Dad who was scratched! Butterscotch’s last two weeks they also gave him sugar water to boost his energy. But Butterscotch just wouldn’t eat and drink on his own. He was such a sad sight to see, looking more like those Build-a-Bear animal skins, than a real live kitty. His last week he could barely walk. We moved his litter box and bed inside so he could be warm. Kevin slept on the sofa each night so he could be near Butterscotch. 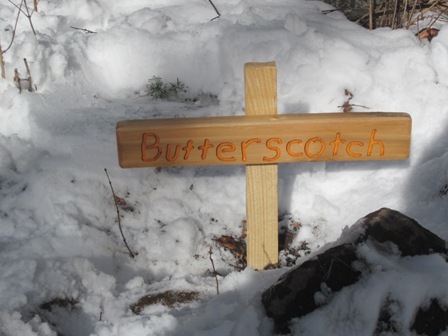 The afternoon Butterscotch died, our oldest son Jacob and my husband Kent dug a grave for Butterscotch under the tree with the wooden swing where Kevin and Butterscotch spent many a summer day. It was 5 degrees and the sun was just going down behind the mountain when Kevin placed Butterscotch’s box in the frozen ground. Kevin helped cover the box with soil, and we put rocks on top. Kent said a prayer for Butterscotch. 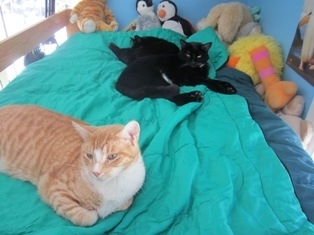 Kevin now has two orange cats that will greet him in heaven, as he lost Jellybean during a 2006 forest fire evacuation. We plan to plant some orange and yellow flowers as a memorial in the spring. Did we pray for Butterscotch? Oh, yes! Kevin loved him so much. 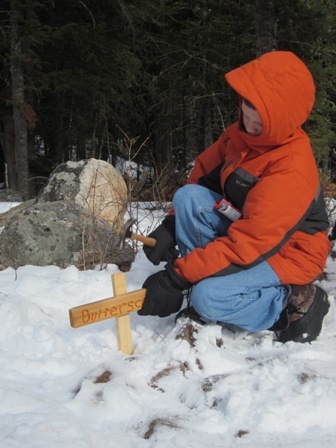 At camp in the summer he would write Butterscotch’s name on a slip of paper for prayer at our Sunday praise service. In the fall he drew pictures of Butterscotch and started a card shop called, “Kevin’s Kat Kards.” When Butterscotch started to get sick, we prayed for him every night. What did Jesus do with those prayers? I do not know. I know He heard us, but His answer wasn’t the one we wanted. We’ve had other cats disappear and we prayed for them to come back (Beany in 1998, Jellybean in 2006, Snicklefritz in 2009). We prayed for each cat for a year, and it didn’t return. I thought the not-knowing was the worst part. But watching a beloved pet shrivel up into skin and bones is just as traumatic. Why doesn’t God answer these prayers as we ask? I don’t have answers. But I do know that Jesus comforts us. Kevin couldn’t do his school work for a few weeks after losing his kitty. But then he started doing school again and talking about a new orange kitty. Somehow the Holy Spirit comes and ministers to us in our deepest sadness and fixes the hurts that we can’t ever imagine going away. I like to picture these pets in heaven. Jesus promises He loves the sparrows and all His creatures. I imagine they are running through a field of flowers, just waiting for their beloved owners to come to heaven, too. And when Kevin arrives in heaven, besides meeting Jesus, he will be tackled by at least two orange kitties who love him very much. This entry was posted in My Tea Cupp for Moms and tagged good-bye to pets, My Tea Cupp Prayers by Jennifer Grace. Bookmark the permalink.